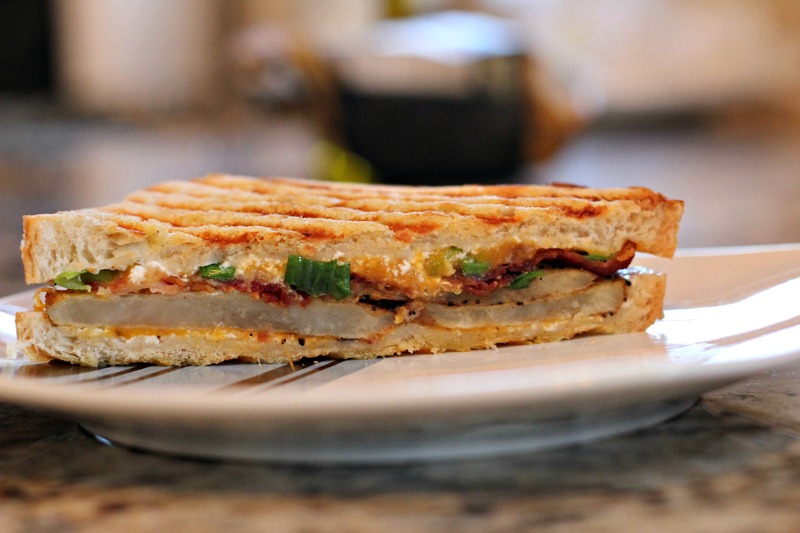 I have been so anxious to try this amazing baked potato panini, and it did not disappoint. If you love loaded baked potatoes, with all their starchy, cheesy, bacony goodness, you will love this. And trust me, you will be super full too. This is the most filling sandwich I’ve ever eaten! When I eat a real loaded baked potato, I have a tendency to eat off all the goody on top and then only a few bites of actual plain potato. So this sandwich was great for me because it was all the deliciousness but without all the plainness once you get past the toppings. The combo of salty potatoes, smoky bacon, and melty cheese was just divine! And of course buttery, crusty bread to top it all off was perfect! I love finding creative sandwich recipes and getting to use my panini press. This awesome recipe came from BS In the Kitchen. You can also find lots of other creative sandwich ideas over at SaniPanini! Heat a pan on medium heat with enough oil to lightly cover the bottom. Cut your potato lengthwise into even slices, you will need about 4 slices for the sandwich. Season potatoes with salt, pepper, and garlic powder and cook each side until browned and crispy. In another pan cook your bacon on medium heat to desired tenderness. While everything is cooking, generously butter the outside of each piece of bread. On the inside, put about 1 tablespoon of sour cream on each slice as well as slices of cheddar cheese on each side. Once your potatoes and bacon are finished frying, dab them on paper towel to remove some grease. Fan the potatoes out on your bottom slice of bread, put a little more sour cream on top of the potatoes if you desire (I did to help the bacon and chives stick in the sandwich). Top with Bacon and chives and then put sandwich together. If you have a panini press, put sandwich in press for about 2 minutes. If you don't have a panini press, just grill the sandwich in a pan on medium heat until each side becomes golden brown. Uhm this looks totally amazing! I dont eat pork so I’m totally trying this with turkey bacon!